As an OMS missionary, I get to serve our missionaries and also ministry leaders from many other nations and organizations. In September, my travels took me to South Africa and Mozambique in Africa, where I had the honor of working with leaders from over a dozen nations and a dozen ministries. During the two week trip, we ministered mainly around Maputo, Mozambique. 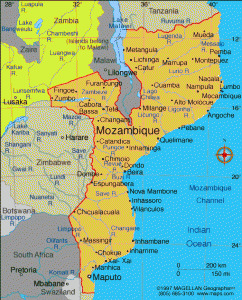 You can see it at the bottom of the map of Mozambique. I spoke at a Christian school to high school students, a seminary and at a church. My OMS team mate Jose Banales and I led three training events to equip leaders with coaching skills. At one of the events, while many church leaders and pastors looked on, I modeled coaching under a beautiful African tree with Pastor Juka, the head of our partner denomination. Watching the power of coaching, one pastor exclaimed, "A movement has begun under this tree!" We also had significant time with our OMS missionary families, who come from five different countries. Their dedication, sacrifice and faithfulness inspire me. I also got to do something on my "bucket list"...go on a real African safari. What an amazing experience! If you'd like to "go with me" on that trip and read the longer version of my experiences and reflections, you can download my journal here. Thanks again to all who "go with us" through prayer, encouragement and financial partnership!